On this blog/Facebook page, I try very hard to stick to scientific facts and avoid discussing politics. Nevertheless, I am frequently accused of being political, even when I am simply reporting a fact. For example, I often post facts about climate change, such as the fact that 2014, 2015, and 2016 all set new records for the warmest year (on average), and when I do that, I nearly always receive comments accusing me of “liberal propaganda” or “pushing a liberal agenda,” but that’s not how facts work. It is demonstrably true that all of those years were the warmest on record, and politics has absolutely nothing to do with it. In other words, facts are inherently not political. They are simply statements of reality. To be clear, facts can, of course, be used to make political arguments and to try to persuade people of a particular political position, but the facts themselves are not political, and that distinction is important. Let me give an example that I recently encountered that will hopefully demonstrate how this plays out and why it is problematic. This example is from a historical topic, not a scientific one, but I think it illustrates the situation nicely. A few days ago, I saw a clip from Adam Ruins Everything where Adam discussed the history of racism in the US housing markets as well as the lingering effects of that racism. At no point in the video did he make any political statements or arguments. He simply explained the facts (the things that are demonstrably true), and he cited his sources. In other words, he simply made claims like, “bill X was passed which did Y,” and at no point did he give a call to action, advocate for a piece of legislation etc. He even went out of his way in the video to say that he is simply reporting the history, not trying to guilt white home owners. As you have probably guessed, however, many of the comments on this video were simply amazing. In the various places that I have seen this video show up, I have seen tons of comments complaining about “liberal propaganda,” “white guilt,” etc. For example, one commenter wrote, “This is just anti-white propaganda.” To be clear, these comments weren’t citing sources showing that the facts in the video were wrong, rather they were simply accusing the video of being political nonsense (in this case liberal nonsense) . This general reaction can be summed up best with the comment below. Again, that’s not how facts work. Simply stating historical facts is not the same thing as making a political argument. Arguing for an action based on those facts would be political, but simply teaching people the facts is not political. Nevertheless, people often respond to facts as if they are political, and the great irony is that this reaction often occurs precisely because of political biases. In other words, someone sees a fact that causes some problem for their political ideology, so instead of dealing with the fact, they accuse the fact itself of being politically motivated. This is extremely problematic for obvious reasons. We can’t hope to have a rational discussion about a topic (whether it be scientific, historical, political, etc.) if people don’t accept that basic facts. Any position that ignores facts is doomed to fail. Note: To be clear, I am not making any general statements about the accuracy of Adam Ruins Everything, but in this particular case, he was simply reporting historical facts. This situation plays itself out all the time on scientific topics, but climate change is probably where it occurs the most frequently, and I don’t fully understand why, because if I make a statement like, “the earth is a spheroid,” no one accuses me of making a political claim. Everyone realizes that I am simply reporting a fact; however, when I state something like, “we have greatly increased the CO2 in the atmosphere, and that CO2 is causing the planet to warm” suddenly people accuse me of pushing a liberal agenda and my inbox is flooded with comments to the effect of, “I thought this page was about science but it is just liberal nonsense.” Do you see the problem there? It is a fact that our CO2 is causing the climate to change, and I always back that fact up with my sources (detailed in previous posts such as this one and this one), but people mistake that fact for a political argument. To be clear, people can certainly use that fact to make a political argument, and when someone says, “we are causing the planet to warm, therefore we should do X,” at that point they are making a political argument, but the fact itself is not political. In other words, whether or not we should do something about climate change is going to depend moral values, views on economics, etc., but none of that is relevant to the simple fact that we are causing the climate to change. Note: I realize that both of my examples so far have involved groups who are generally politically conservative (by the US definition), but just to be clear, liberals do this all the time as well. Here again, I want to be clear that facts can be used as propaganda if they are reported in a misleading or biased way to push some agenda. For example, anti-vaccers like to cite the fact that in some disease outbreaks, most of the people who became infected were vaccinated. That fact is technically true (in some cases), but using it as an argument against vaccination is misleading and leaves out critical information. Namely, it ignores the fact that the rates of disease are consistently higher among the unvaccinated. In cases like that, you could argue that the argument is propaganda, but even there, it is not the fact itself that is the problem. Rather, the problem is the misleading way in which it is presented. Also, generally when I see people making blind accusations that something is propaganda, the fact wasn’t being in any way miss-represented. Rather, people were making the accusation simply because they didn’t like the fact. Finally, the same basic problem occurs for topics that have any sort of religious implications. For example, when I talk about the facts of evolution such as the existence of transitional fossils or the fact that evolution predicted genetic patterns, I’m nearly always met with creationists who accuse me of pushing an atheist agenda. You can see an example of this if you look at the meme on the right. 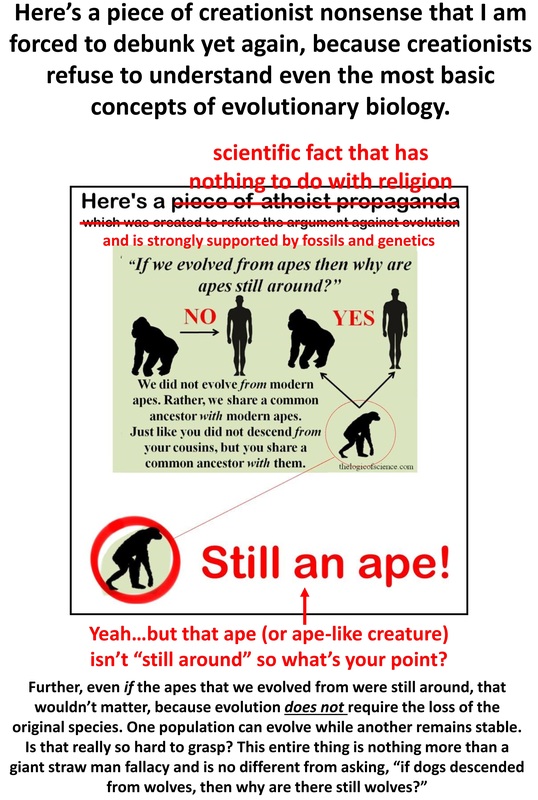 I made the original meme (green), and a creationist group tried to “correct” it (including calling it propaganda), and I corrected it back. Here again, I simply stated a scientific fact that has been repeatedly demonstrated by fossils, genetics, biogeography, etc. It is in no way cherry-picked or misleading. To be clear, that fact certainly does present serious problems for young earth creationists (but not theistic evolutionists), but that doesn’t make it propaganda or religious. The fact itself is simply a statement of reality. To put that another way, the fact is relevant to the topic of religion, but religion is not relevant to the fact. In short, facts are not political, religious, or propaganda. They can be used to make political or religious arguments, and they can even be misrepresented and used as propaganda, but the facts themselves are neutral statements of reality. So, when someone says something like, “vaccines save thousands of lives each year” they are stating a fact, not propaganda. Similarly, when they say, “numerous studies have tested the natural drivers of climate change and found that they cannot explain the current warming,” that is not a political argument, it is a simple, demonstrable fact, and politics have no bearing whatsoever on it. It is very easy to dismiss information that you don’t like as propaganda, but doing so is intellectually dishonest and you do yourself a disservice by giving into that type of cognitive pitfall. To be clear, you should fact check and make sure that a claim is true, the fact wasn’t cherry-picked or misrepresented, etc., but don’t fall into the trap of blindly asserting that anything that disagrees with you is politically motivated or agenda driven. Note: Although I have no interest in debating the Adam Ruins Everything video, I will note that many commenters harped on the use of the phrase “insufferably white” at the beginning, and argued that it meant that the video was propaganda. I would respond to that first by reminding everyone that the show is supposed to be comedic and that was meant to be a joke. Second, that was the only part of the video that was even remotely political. Everything else was simple statements of facts. Again, he listed his sources, so it is easy to fact check him. This entry was posted in Uncategorized and tagged anti vaccine arguments, Bad arguments, evaluating evidence, evolution, global climate change. Bookmark the permalink. Anything can be political. Facts are often cherry picked from a wide variety of perspectives. Especially in the social sciences. Unless we have scientifically tested thoroughly and been peer reviewed in our research and data, for can we be sure of the casual sequence of events? Even then we get things wrong, and with new tools, we revise theories. Social history is very difficult, because we are relying on human perspectives. Very unreliable. Yes, I agree, if you keep it simple. But most people do wave stories around facts, that are political and tainted by many assumptions – even if those assumptions are stated. In other words we can’t help but be political. Even with studies, who funds the studies? Who decides the parameters of the studies? Who decides what is important to study? I often have questions that aren’t answered by scientific studies, because no study has yet been done or peer reviewed in order to discover the answers to that question. Humans want more than a list of facts. Humans have in fact involved to tell and remember stories. As stories from Oliver Sacks’ book, “The Man Who Mistook His Wife for a Hat” we can consider that humans actually make up stories all the time based on a rough idea of facts, but sometimes totally contrary to actual facts that they have been exposed to in the past. Is your point that we should (a moral ought) look at the facts without considering the political implications of that particular set of chosen facts? Can we get a moral ought from a fact? Should we as humans seek to be totally no political? Don’t stories allow us to weave meaning and therefore take meaningful action based on the facts contained within those politically charged stories? Can we really detach arguments from their political stories and still have meaning within them? Not at all. I think that politics should be based entirely on facts and logic, and for things like climate change, I think that policies should be based around the evidence. My point is that the evidence itself is not based on a political position. In other words, the facts of climate change aren’t liberal or conservative, republican or democrat. They are just facts. Those facts have political implications, but the facts themselves are not political. And yet there are still ‘facts’ that are used on both sides of the climate debate, to both support and refute it. I’m no climate scientist so can’t comment on the validity of one or the other. There really aren’t. One side has facts produces by thousands of rigorous peer-reviewed studies, while the other has conjecture and a blind rejection of those facts. The majority of climate change deniers “facts” are simply false, and the remaining ones are cherry-picked and taken our of context. There are many problems with this. First – people have problem with assesing validity of information (remember, that you do not know a priori if something is a fact).Second – people have problem with valid argumentation (fallacies) so they take facts and try to use them to back up their opinions, e.g. “climate was always changing” is a fact. THe person that hears this facts cerates a “credible” story that back up opinion: so changes in climate today are natural. There is obvvious fallacy in this thinking, but the person is happy to have the story coherent with opinios. It would be nice if it worked like this. Unfortunately we do not have rational mind, but our mind is rationalizing. I do not know if you’ve read “Righeous mind” by Jonathan Haidt. It is based on scientific facts about how morality and political views are created and what they are based on. Unfortunately they are not based on facts. I think that is the point the comment was about. We choose facts that suits our opinions and reject facts that are opposite. This is simple psychological mechanism. This is a good post and I agree with it in most respects. I think the problem arises in presenting facts as points of data or isolated events. ‘Facts’ have very little meaning without being situated in a context of relation with other facts. I recently taught a class in critical thinking, and I used the example of social statistics to demonstrate how easily even accurate data can misrepresent reality. For instance, presenting accurate statistics about the prevalence of crime in certain demographics can still lead to faulty conclusions about those demographics if these statistics are not related to other statistics detailing e.g. social environments etc. In fact, even being circumspect with statistics is often not enough to gain insight into issues. In the sciences (both social and natural), without an understanding of the epistemological assumptions scientists operate under, the relevance and meaning of facts are often lost on those not familiar with scientific and philosophical methodology. We are finding, I think, that the facts cannot speak for themselves. If people cannot make sense of statements of reality in the context of what they believe to constitute reality, facts will seldom gain traction in their minds. I’d extend this further and say that science by itself cannot make any value judgements. It can only tell us what is, and what might possibly happen, and what can be done to make other things happen. There is no “good” or “bad” as far as science is concerned. It can tell us the consequences of our actions or suggest alternative actions but it cannot judge whether any of those are good or bad. That is where politics comes in. I really wish those people who persist in denying the facts and subsequent consequences of global warming ought to just fess up and say that the short-term profits from the continued exploitation of fossil fuels are more valuable when weighed against the prospect of a future earth too warm to permit agriculture as we do it today. That is what their political value system really seems to be about, it seems. I am in agreement with Anonymous Coward and Aperspective. Generally speaking, facts are facts although the data could be manipulated to form problematic facts. Pols are a good example of that. However, the problem with facts is how they are used or interpreted. That is the political problem with them. A good example is AIG statement that they use the same facts, but just with different starting points. Their starting point, of course, to a scientific reality based existence is laughable, but AIG gets traction from their interpretation of facts because it fits in nicely with their and other like minded individuals world view. It comforts them when assaulted by a science based reality to be able to say that it is “just a different way of thinking and we are right.” because our reality is different. This line of thinking leads into a more Balkanized society. Without getting too political, this is a phenomena I see more extensively being played out in our society across all sectors than I have ever seen before in my 61 years of existence much to the detriment of our civil society. Again, I certainly agree that facts can be misrepresented, and as I said in the post, everyone should examine claims carefully to make sure that the facts aren’t being misrepresented. The point that I was trying to make (and apparently did a poor job of making) is simply that the facts themselves are not political, but people often respond to them as if they are political, even when they are being presented fairly and without bias. That is a pitfall that we should all strive to avoid. I’m saving this because I know someone will post the creationist “correction,” and I’ll need a retort. The riposte of “dogs descended from wolves and there are still wolves” is an excellent point. If humans and apes aren’t related, then why do we share such a high percentage of genetic material? Stating the evidence about this isn’t inherently political; the information can be used to further or forestall a political agenda, but stating facts based on the science/scientific method is neutral. By the way, somewhat OT but I’ve been reading your series of posts on basic statistics and would like to ask you for a recommendation on a good textbook that covers all of that in more detail. It been years since I watched armed department of justice personal tape off the offices of various technical and administration leaders at a former organization. The justice department was concerned that how facts were evaluated had gotten political. Again, people can use facts to make political arguments, but that does not make the facts themselves political.